Whether your mom wants to go by Memaw, Noni, Nana, traditional Grandma, or something completely off the wall, she hopes to be celebrated on Mother's Day this year, too. And it's double the fun for her, since she's someone's mom and also someone's grandma. Most grandmas I know love simple and thoughtful gifts, especially if they're either handmade by their grandchildren or gifts that feature photos of her family. Don't forget Mother's Day is May 13, so it's time to scope out some Mother's Day gifts for Grandma she'll treasure forever. I know Grandma will love a picture frame, a customized print, a gift basket or even a letter holder, because she will love anything that comes from you and her grandchild(ren). Grandmas are awesome like that. The more sentimental the better, for most of the grandmas I know. And if you really want to make her day special, give her one of these gifts in person, because as you and I know, they can never see their grandchildren enough, which they make abundantly clear when you talk to them on the phone. If these gifts aren't doable, I know she'd love a handmade card from your kid that she can hang on the refrigerator or put safely away to treasure forever. I absolutely love Shutterfly. I made one for our wedding day, and I'm planning on making a book for my son chronicling my pregnancy with him. I hope it will be complete with babymoon pictures, pictures of Dad and Grandpa painting the nursery, pictures of Dad putting together baby furniture, and maternity photos. Grandma would love a book of photos of your family — especially of their grandchild — so she can look at it whenever she wants. Does your kid's grandma live out of state? All grandparents love pictures of their grandkids, right? This customizable frame is even cooler, because you can personalize which states you want on the frame, your kid's name, and even what "Grandma" is called, whether it's Memaw, Noni, Nana, or something else unique. This gift is special because it's like a joint gift, from you as daughter/son to Mom and grandkid to Grandma. Everything is customizable, and you can even add birthstones to the top of the pendants for a very small charge. This unique take on a print is a pretty sweet Mother's Day gift for Grandma. Like almost all items from Etsy — especially on this list — you can change "Grandma" to whatever your special lady likes to be called. This cutting board is obviously supposed to be on display as decor for your grandparents' kitchen and not used. So hopefully Grandma won't think you're expecting her to whip something up on Mother's Day — even though everything she makes is absolutely delicious. This gift is especially sweet because the name is customizable and there's plenty of room to add all the grandchildren you like. For some reason, this bag reminded me of Sophia Petrillo's purse in The Golden Girls, and she is the ultimate cool grandma. 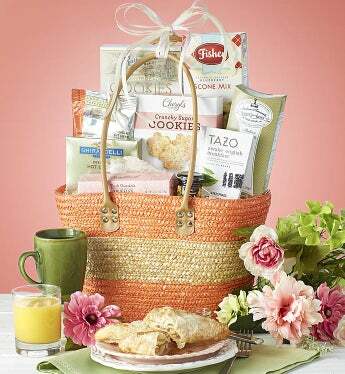 And I'm sure the Sophia Petrillo in your life would love this adorable tote filled with her favorite brunch treats. While my mom (Memaw) enjoys margaritas, my husband's mom (Noni) enjoys tea. And this just might be what my husband and I are getting his mom for Mother's Day. Grandma can perfect her own personalized blend of tea, made especially for her. All of these pieces are beautifully handcrafted, and Grandma will love wearing them out and about and being able to tell her friends and folks at the grocery store that these flowers are for her grandchild's birth month. Perfect for our son’s “Noni” — since she’s Italian — but this collection would also be perfect for anyone who loves wine and Italian food. 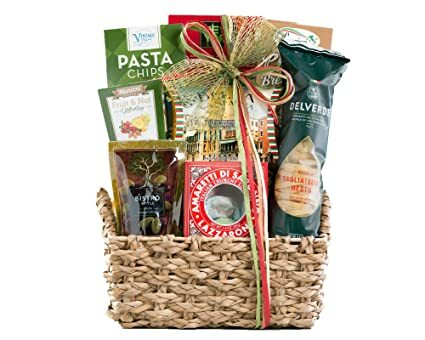 Also, Wine Country Gift Basket offers a variety of baskets for a variety of interests, and I'm sure there's something out there for every kind of Grandma. When I was a kid, I'd write letters back and forth to my Grandma in Pennsylvania. And even now, I'll sometimes write my mother-in-law letters by hand and we go back and forth. How cool would it be to have had a book set for my Grandma to keep everything in — and eventually pass down to me to keep and remember forever? Maybe I can convince our son to sit down and write a real hand-written letter to his Noni out of state who he doesn't get to see often. Don't forget Grandma on May 13. Mother's Day is even more special for her now that she has a grandchild.